My sister and I were hanging out one weekend watching the Food Network, eating cookie dough and trying to stay cool; Texas summers are brutal. We ended up watching a food truck special that highlighted some of the best food trucks from cities all over the country. Oh My! Pocket Pies was featured, and as luck would have it, they were based in Houston. We decided we had to try a food truck pocket pie. I grabbed my laptop to see where we could find the mobile gourmet. Turns out, the only way to locate the food trucks in Houston, unless you happen upon them, is to follow them on Twitter. They post where they are or where they're going to be. I had created a Twitter account, but having no clue how Twitter worked or what to say, I left it to collect electronic dust. When I finally reactivated my Twitter account, I was required to select a few accounts to follow. I followed Andrew Breitbart and a some news accounts, just enough to get me to the next step of the account set-up, then quickly moved on to search for Houston food trucks. Based on my initial selections, Twitter kept recommending liberty oriented accounts to follow. Having recently become politically active, I kept clicking "follow." When I logged in to plot our food truck conquest, I got sucked into all of the information streaming down my screen. I started engaging people I'd followed and in no time, was hooked. I loved how much information was available and how quickly I could access it. I felt like I'd stumbled upon a little treasure trove of first scoops; all of the news before it was news. Not to mention an unusual ability to access people I'd under no normal circumstance have access to. What ultimately drew me to the big, bad world of politics wasn't so much politics, but that the media wasn't telling the stories I thought were the obvious stories to tell. Excited about this new way to share information, I began tweeting stories I thought needed to be seen. Within three months I was invited to write for a blog called The Right Scoop. Since I'd made a few friends online and was officially a blogger, it seemed like a good idea to head to Denver for Blogcon. 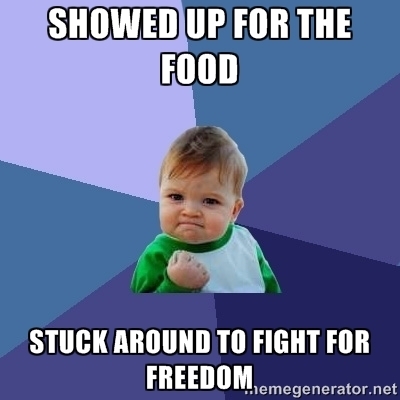 It was at Blogcon that I learned about FreedomWorks and was first exposed to conservative political activism. You see, before I came to the liberty movement, I was a leftist, but that's a whole other story. In any case, I knew I'd found my place. That was almost exactly two years ago. I still haven't visited the Oh My! Pocket Pies truck, or any food truck in Houston for that matter. I'm now employed with an independent investigative journalism outfit that tells the stories the media won't. We make news. I also get to share stories with you and when I'm fortunate enough, tell your stories. This is just my providencial journey, but there is a broader lesson here. You never know what will lead people to activism. More often than not, it's not politics, it's personal experiences. It was the kindness and acceptance of the people I met at Blogcon two years ago that had a huge impact on my perception of the liberty movement. It was understanding that no matter how small my platform or how much time I had to spare, every little thing I was able to contribute to the cause of liberty and freedom actually made a difference. From blog posts, to tweets, to phone calls, to sign waving and door knocking or even just talking to the grocery store checker about the increasing price of groceries - it all matters. Brazen statism makes liberty increasingly more appealing. As more of our fellow citizens awaken and see the nasty political realities ahead, we should be there to welcome them with open arms, show them the ropes and encourage them with the message of hope intrinsic in liberty and freedom. They need to know they can make a difference. After all, "three millions of people, armed in the holy cause of Liberty, and in such a country as that which we possess, are invincible by any force which our enemy can send against us," said Patrick Henry. Eventually I'll get my pocket pie, but for now, I'm content to fight in order to further the principles of liberty and freedom. 2) https://truckingdepot.blogspot.com . Both are well reputable trucking jobs information blog. Dear Senator, On behalf of over a million FreedomWorks members nationwide, I urge you to cosponsor S.299, the Regulations from the Executive in Need of Scrutiny (REINS) Act. Introduced by Senator Rand Paul (R-KY) along with 24 original co-sponsors, this legislation requires a vote in Congress on any “major” regulations issued by the Executive Branch before it could be enforced on the American people. During the hot summer months, it’s practically an American tradition for children to set up lemonade stands in their neighborhood. The children learn valuable skills on how to run a business while earning some extra summer cash. A few years ago, the image of bureaucrats forcibly shutting down innocent lemonade stands may have been satire. Not anymore. Say NO to Joe, Kill the "Kill Switch"
This is a quick reminder to tell you that today is our Day of Action to stop the EPA power grab and support the Murkowski Resolution of Disapproval. Your senators need to hear from you TODAY.We have all worked too hard over the past months to let this go down without a serious fight. Please visit and call your senators' district offices - and urge your friends to do so as well.